Particle physics is a specific subdivision of physics that studies the building blocks of the universe and their properties. Due to the minute size of these elementary particles, physicists rely on powerful particle accelerators to probe the infinitesimal and mysterious realm. Thus particle physics is also known as high-energy physics. In the past decades, theoretical particle physicists and experimental particle physicists have worked together to build the now widely accepted Standard Model. 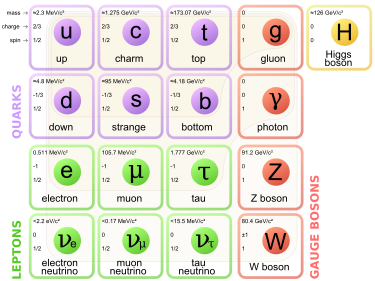 The current Standard Model pictures a world composed of four groups of elementary particles: matter particles, antimatter particles, gauge boson and scalar boson. The matter particles are further branched out into quarks and leptons. Quarks are the building blocks of various matters including the nucleus of an atom. There are six types of quarks: up, down, charm, strange, bottom, top. Due to a constraint called color confinement, quarks cannot be isolated singularly and therefore cannot be observed directly. Scientists at Stanford Linear Accelerator Center and Collider Detector at Fermilab thus spent almost three decades using high-energy accelerators to verify the quark model that was proposed in 1964. The confirmation of quark model has furthered the world’s understanding in elementary particles. Protons and neutrons, subatomic particles that were thought to be indivisible, are now known to be composed of up and down quarks. Since an up quark has an electric charge of 2/3 and a down quark carries -1/3 of the electric charge, a proton formed by 2 up quarks and 1 down quark carries an electric charge of 1. For every type of quark there is antiquark, which forms the antimatter particles group along with antileptons. There are also six types of leptons and the best known of all is the electron. The six types of lepton are divided into two smaller groups of charged leptons and neutral leptons. Electron, muon and tau are charged leptons with -1 electric charge that can form compositions like atoms by combining with other particles. Electron neutrinos, muon neutrinos and tau neutrinos have no net electric charge and rarely interact with other objects. Muon neutrino was made famous in 2011 when researchers at European laboratory for particle physics (CERN) reported the faster-than-light phenomenon in both September and November. This anomaly was later found to be a mistake due to a faulty connection that impaired the accuracy of fiber optic timing system. Two leaders of the experiment stepped down in the wake of this event. Now sitting next to the Tevatron ring of Fermilab, I could not help but pay the sincerest reverence to once the most powerful accelerator that led to the discovery of top and bottom quarks and guided scientists to the discovery of the god particle higgs boson. Though Tevatron stopped colliding protons and antiprotons three years ago and is now obsolete, the milestone it set and the spirit it represented still motivate every visitor and scientist to unveil the mysteries of the universe. This entry was posted in Science and tagged elementary particles, lepton, particle physics, quark, Standard Model on March 14, 2014 by timchen95.